Thursday August 15th 1901 The boys finished their fence in the forenoon and in the afternoon got the new tank and put it over at Wescotts I felt the heat terribly today. I wrote to Laura in the afternoon Friday August 16th 1901 I was busy about the work all forenoon and went down to spend the afternoon with Mother while Will went on to town. Charlie Neverer quit work today. Saturday August 17th 1901 I was busy about the work all forenoon and went down home while Will went to town. I took Fannies butter down It looked very much like rain tonight but cleared again Sunday August 18th 1901 Will and I went to see a man about doing some carpenter work and to see about watering the stock at the pasture. It was nearly noon when we came home. I read and rested in the afternoon. Ida gone all day. 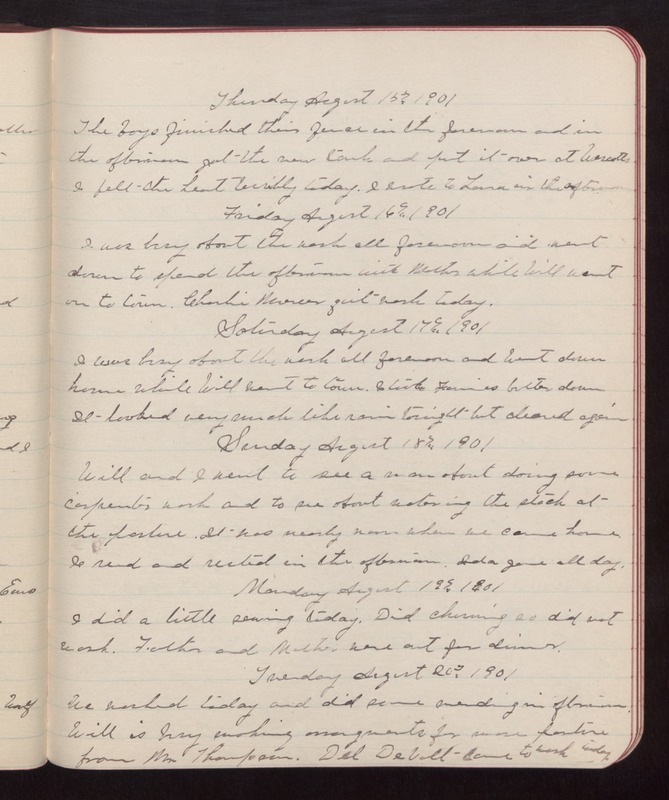 Monday August 19th 1901 I did a little sewing today. Did churning so did not work. Father and Mother were out for dinner. Tuesday August 20th 1901 We washed today and did some mending in afternoon. Will is busy making arrangements for more pasture from Mr Thompson. Del DeVolt came to work today.